Let’s face it; we have all toiled over spreadsheets at work at some point or another. Whether it’s establishing a budget or planning for the future, spreadsheets are a go-to tool in the workplace. There’s no denying spreadsheets are part of how our teams operate. The familiar grid interface makes it easy to manipulate and visualize data in so many different ways. Yet even the biggest spreadsheet loyalists recognize that current options limit the ability to put the right data in the hands of the right people. Worksheets offer a cloud-based, collaborative spreadsheet built directly into the core of Workday’s technology platform. At Workday, we realized there had to be a better way. We wanted to provide a modern, collaborative spreadsheet experience for our customers. An experience where co-workers collaborate around live data, and where all the data resides in a secure, enterprise environment. An experience that removes the headaches and security risks of spreadsheets without sacrificing the look, feel, and functionality we love. That’s why I’m excited to announce Worksheets, the first native spreadsheet experience for enterprise cloud applications that officially launched today with the availability of Workday Planning. This new offering is a game changer that speaks to our commitment to continually build innovative tools into the heart of our technology platform, enabling our customers to drive alignment and productivity throughout their cross-functional teams. What are Worksheets, and how do they differ from traditional spreadsheets? Worksheets offer a cloud-based, collaborative spreadsheet built directly into the core of Workday’s technology platform. It’s not a bolt-on interface experience requiring yet another login. 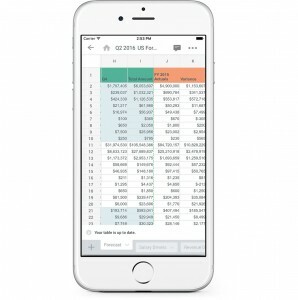 Instead, it’s a different way to work with the financial, people, and operational data in Workday—all in that familiar grid interface. Unlike traditional spreadsheets, users can collaborate and make changes in real-time, and drill down into transactions such as expenses or employee profiles, to get the information required to make decisions and take action. Worksheets also leverage the same security model as the rest of Workday, so customers can easily configure, access, and share certain sheets, tabs, or even cells by tagging other employees. What features do Worksheets offer that I can’t find in other tools? There’s no shortage of exciting features and nifty tricks that differentiate Worksheets from the pack, but I think there are three big takeaways that showcase how having this tool unified as part of our core system enables our customers to do so much more. Collaborate with co-workers from any device, anywhere. We designed Worksheets to reflect where and how people work, so like everything we do at Workday, Worksheets are mobile at the core. Cross-functional teams can collaborate, make comments, and share plans with one another on any device, at any time. Manage the reality of continuous business change. Managing traditional workflow is tough with traditional spreadsheets. Users struggle to keep up when changes are made. We’ve tackled this reality head on with the ability to make real-time changes in a Worksheet and automate how that change ripples across Workday. Take, for example, the steps it might require with traditional approaches to move a team to a new office. Spreadsheets fly everywhere through email and shared folders in an attempt to capture data and collaborate. With Worksheets, you can now simply collaborate in a single, shared version of the truth within the familiar spreadsheet interface that provides a real-time view of your core system-of-record data. When new people are hired, or when things change, it’s reflected instantly. Explore and tell stories with data. With Worksheets, customers are able to visualize and explore live data from a variety of sources in a way that traditional spreadsheets and reports just don’t allow. Worksheets empower users with real-time data, so they can get to the right combination of live information to answer key business questions, whether they are in the process of preparing a plan, or drilling-down into new levels of detail in response to rapid-fire questions during a presentation. But wait . . . will I still have my spreadsheet functions? Yes, and then some. There are approximately 500 functions supported in Worksheets today, including those our customers know and love such as SUMIF, VLOOKUP, CONCATENATE, and hundreds of other go-tos. We also have developed approximately 70 unique functions that extend the concept of spreadsheets and enable our customers to do some really interesting things. For example, a simple yet powerful function we call NOTIFYIF will send an alert to your Workday inbox when a particular area of a Worksheet changes or is completed, such as a manager finalizing his headcount number for the quarter. Can I import my existing spreadsheets into Workday? Yes. Customers can easily upload all of their existing xls, xlsx, csv, and txv files into Worksheets while keeping the same functions and formatting intact. What are some use cases for Worksheets in Workday? As noted earlier, we saw an incredible opportunity to first launch Worksheets as part of Workday Planning. However, we’re working with our customers to explore a number of additional use cases where there is a high dependency on spreadsheet collaboration, such as ad-hoc reporting, project and portfolio management, and merit and compensation. I’m incredibly proud of what our team has accomplished with Worksheets, and look forward to seeing how our customers uncover new ways to produce their best work and collaborate together with this exciting new tool.